Great River Co-op - Out and About! This past weekend was a busy one for the Great River Food Co-op! We got out and about in the community, spreading the word about YOUR new store coming to Walpole. First, we had a table at the annual Fall Mountain Regional School District Health Fair. Around 300 employees of the district were expected to attend, and make the rounds to the many vendors. 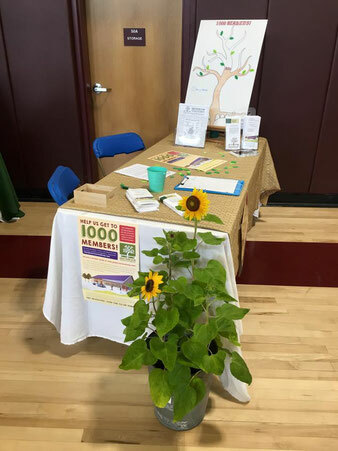 The door prize of a lovely sunflower from Johnson’s Greenhouse was a huge draw and we had many interested attendees grab brochures to learn more. Next, we had a table at the Acworth Village Store’s Locavore event. Once again, many eager visitors asked questions and learned how they could get involved. These small events are a great way to get the word out, but we need help! If you’d like to help us reach our goal of 1,000 members by the end of 2016, please sign up to represent the Co-op at an upcoming event. It can be an area farmer’s market, or even at the local post offices. You can make a difference in getting this project rolling! Email us at info@greatriverfoodcoop.com for more information.